You will need the Adobe Reader to view this PDF. In an effort to save some of the 500,000 lives expected to be lost in roadway departures in the next 25 years, the highway community needs to move forward installing rumble strips as appropriate. This guide serves to educate safety, planning, and design professionals about the need to collaborate with the bicycle community and understand the functional and safety needs of bicyclists as edge line, shoulder, and even center line rumble strips are being considered for implementation. 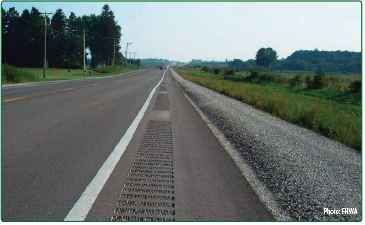 The guide presents design flexibilities on bicyclist accommodation that have been used by agencies with successful large-scale implementation of rumble strips on two-lane rural roads. Longitudinal rumble strips are an effective, low-cost countermeasure for preventing roadway departure crashes, including both run-off-road and opposite direction sideswipe crashes. Rumble strips1,2 are milled or raised patterns near the center line or edge line of the roadway that provide both an audible warning (rumbling sound) and a physical vibration to alert drivers that they are crossing into opposing traffic or leaving the roadway. Rumble strips placed underneath center line or edge line striping are referred to as "rumble stripes." FIGURE 2. Center Line Rumble Strips. Rumble Strip Challenges for Bicyclists. Whether riding in the lane or on the shoulder, bicyclists are legal road users and have the right to use the roadway. Rumble strips can pose challenges to bicyclists if their needs are not considered. It is important to keep in mind that bicyclists have varying abilities. Experienced riders prefer a direct route and are comfortable riding with the flow of traffic and using the full width of narrow travel lanes when appropriate.Casual and less confident riders typically ride more slowly and may use a less direct route to avoid heavy traffic. The equipment also varies, from very light bikes with high-pressure tires that may be damaged by roadway debris to heavy-duty bikes with wide tires that can easily ride on a gravel shoulder. Traversing rumble strips on a bicycle can be uncomfortable and could possibly lead to loss of control. Gaps in the rumble strip are provided to allow bicyclists to travel between the shoulder and the travel lane, to turn left, and to avoid debris or other obstacles in their path. Depending on the size and location, a shoulder rumble strip may remove the shoulder as an option for bicycle travel. Center line rumble strips are less problematic, the primary concerns being that drivers may be less likely to cross the rumble strips to pass a bicyclist or that drivers may move away from the rumble strip, closer to where the bicyclist is likely to be traveling. The strategic placement and design of edge line, shoulder, or center line rumble strips is important as practitioners balance safety improvements and increasing the viability of alternative modes of transportation. While rumble strips provide many safety benefits for motor vehicles, they can present rideability issues for bicyclists. A paved shoulder is often the safest location for bicycle travel, particularly on roadways with higher operating speeds than those typically achieved by bicyclists. However, bicyclists may utilize the travel lane or alternate between the shoulder and travel lane depending on conditions. Designated bicycle routes6 and other roadways with known frequent bicycle traffic may warrant special consideration regarding the effects of adding rumble strips. Flexibility in application is available on all roadways, but the extent of current and projected bicycle traffic may help agencies prioritize where to employ alternative design options to better accommodate bicyclists and increase use of rumble strips beyond the standard practices. Rumble strips are most effective on or very near the edge of the travel lane7 both because they provide more alerting noise and vibration at shallower departure angles and because the sooner the driver is alerted that he or she is leaving the travel lane, the more likely a recovery maneuver is to succeed. However, the 2 or 3 feet of shoulder nearest the travel lane is also a preferred location for bicyclists in some cases, as it is out of the travel lane and there is less likely to be debris. The 2012 AASHTO Guide for the Development of Bicycle Facilities states that "rumble strips are not recommended on shoulders used by bicyclists unless there is a minimum clear path of 4 feet from the rumble strip to the outside edge of a paved shoulder, or 5 feet to the adjacent curb, guardrail, or other obstacle." Many DOTs have policies or guidance for edge line or shoulder rumble strips where there is sufficient existing paved shoulder width beyond it for the bicyclist to travel. However, agencies need not limit themselves to use on roadways where these standard applications provide sufficient space, as flexibility from an agency's standard rumble strip design may provide the opportunity to improve overall safety on a wider variety of roads. This option is important for reducing severe roadway departure crashes, particularly on roadways where a systemic or spot analysis indicates a safety concern. For 3R (resurfacing, restoration, or rehabilitation) projects where identified safety concerns exist or for safety projects, agencies may also want to consider these alternative design options even if the full standard width beyond the rumble strip cannot be attained. The goal is to optimize safety for all road users. The needs of bicyclists and the trade-offs in safety effectiveness of alternative rumble strip designs can be considered, along with other concerns (such as noise and pavement integrity), to determine the best design for each corridor on a project-by-project basis. Shoulders are a proven safety feature for all road users, but are particularly beneficial in reducing conflicts between slower traffic and those vehicles traveling at typical highway speeds. 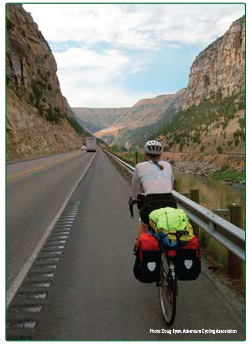 The presence, composition, and integrity of the shoulder surface can affect where a bicyclist chooses to travel. Many bicyclists prefer to use the shoulder when it is paved and well maintained. If a shoulder is not paved, it is more likely that bicyclists will ride in the travel lane, even when vehicles are passing them. Edge line rumble stripes may afford bicyclists additional travel width by shifting the rumble strips from 6 inches to 2 feet closer to the travel lane. Roads with edge line rumble stripes are more likely to have rideable shoulder space that is free of debris. The noise associated with vehicles passing over the edge line rumble stripe can act as an "alert" to bicyclists that vehicles are encroaching on the shoulder, and it improves the likelihood that the motorist will return to their lane before leaving the roadway. It may be done as a standard practice or on a case-by-case basis. It may depend on the classification of the roadway or the paved lane and shoulder widths. Figure 4 shows an example of an early rumble strip installation where the offset was 12 inches from the edge line and 16-inch rumbles were used, leaving only 2 to 3 feet for bicyclists. Current installations use 12-inch rumble strips with either a 6-inch offset or an edge line rumble stripe to provide an additional 10 to 16 inches of space for bicyclists traveling on the shoulder. States vary slightly in their preference for shoulder rumble strips or edge line rumble stripes. States' standard practices also vary in the minimum shoulder width requirements for installing either type of rumble strip or stripe. Typical minimum shoulder width requirements are between 4 and 6 feet. Iowa DOT uses 6-inch wide edge line rumble stripes on select county roads where there is no paved shoulder and a history of high run-off-the-road crashes. "If safety concerns outweigh other issues such as noise and bicycle use, non-freeway centerline and shoulder corrugations can be considered for use on roadways that do not meet the criteria given above." Another component of accommodating bicyclists using the shoulder where rumble strips are present is to provide gaps within the continuous rumble strips so that bicyclists can easily move between the shoulder and travel lane as necessary to avoid debris, make turns, pass, etc. The gaps are designed such that it is unlikely a motor vehicle will cross the line of rumble strips without alerting the driver. Most roadway departures where a rumble strip will reduce the likelihood or severity of a crash involve a low angle of departure (the driver drifts off the road as opposed to steering sharply to avoid an animal). A properly designed pattern considers the size of the rumble strips and the gap pattern. Since the gap exists entirely for use by bicyclists, the design should also consider how much space a cyclist needs to pass between the gaps, which may vary on steep grades. Gaps are not always needed but are encouraged, even when the surface on the other side of the rumble strip is not ideal for cycling. Figure 5 shows a typical example of rumble strips with a gap for bicyclists. FIGURE 4. Example of Bicycle Gap. It is important to understand the exact concerns of the bicycling community, to be flexible regarding the implementation and design of rumble strips, and to maintain dialogue with the bicycle community and other road users. In Washington State, whether the road is undivided or divided is a determining factor for rumble strip depth. On undivided highways, where bicycle traffic is greater in the State, the typical rumble strip depth is 3/8 inch, whereas on divided highways, it is ½ inch to 5/8 inch. Washington State DOT allows a large annual bicycle race to utilize the same roadway every year. Due to the large size of the race and the negative effects they could cause the bicyclists during the race, the DOT decided not to install rumble strips on this roadway.19 This is an isolated, unique situation, and is a good example of trade-offs being considered on a case-by-case basis. As agencies consider installing edge line or shoulder rumble strips, public outreach to and involvement of the bicycle community is essential. South Carolina DOT (SCDOT) developed a public marketing campaign, "Recognize-React-Recover" that seeks to educate the public on rumble strip safety benefits and how to react when leaving the roadway. In this campaign, SCDOT recognized the importance of engaging the bicycle community during the transportation planning phase and as an ongoing effort. Edge line (or shoulder) and center line rumble strips are very effective at reducing severe motor vehicle crashes. Their use can, however, present challenges for bicyclists safely sharing the roadway. Where existing pavement widths do not readily accommodate both rumble strips and bicyclists, there are a number of ways to optimize safety for all road users. Paving or widening shoulders, while often providing the greatest overall safety benefit, is often not feasible with available funds. In those situations, flexibility in the design of rumble strips may be adequate to reduce the impacts to bicyclists. Shoulder rumble strips can be installed at the edge of the travel lane, which widens the available space for bicyclists and may provide a more debris-free ride. Depending on the standard design of an agency, narrower rumble strips may still be effective to alert drivers of passenger vehicles while providing several extra inches that may be useful to a bicyclist riding on a rather narrow shoulder. Bicycle gaps are a design feature that is encouraged in most situations where bicyclists are likely to be using a corridor. These design modifications have been used to varying degrees by many State DOTs, both as a standard practice and on a case-by-case basis, to improve their highways. Many States have also found that working with bicycle groups to understand their needs as road users, educating them on the safety benefits of rumble strips, and addressing the bicycle community's concerns when implementing policies is critical to the successful implementation of this safety countermeasure. ✓ FHWA's Rumble Strip Website: http://safety.fhwa.dot.gov/roadway_dept/pavement/rumble_strips/. 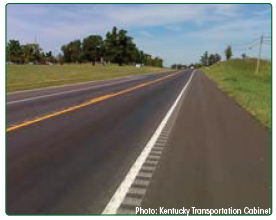 ✓ NCHRP Report 641: Guidance for the Design and Application of Shoulder and Centerline Rumble Strips: http://onlinepubs.trb.org/onlinepubs/nchrp/nchrp_rpt_641.pdf. ✓ AASHTO's Guide for the Development of Bicycle Facilities, 4th Edition: https://bookstore.transportation.org/item_details.aspx?ID=1943. 1 FHWA Technical Advisory T 5040.39: Shoulder and Edge Line Rumble Strips. Available at: http://safety.fhwa.dot.gov/roadway_dept/pavement/rumble_strips/t504039/. 2 FHWA Technical Advisory T5040.40: Center Line Rumble Strips. Available at: http://safety.fhwa.dot.gov/roadway_dept/pavement/rumble_strips/t504040/. 3 Federal Highway Administration (FHWA) Office of Safety, "Rumble Strips and Stripes" web page. Available at: http://safety.fhwa.dot.gov/roadway_dept/pavement/rumble_strips/. 4 D. J. Torbic, J. M. Hutton, et al. 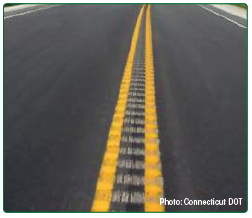 NCHRP Report 641, Guidance for the Design and Application of Shoulder and Centerline Rumble Strips, Transportation Research Board, Washington D.C., 2009. Available at: http://onlinepubs.trb.org/onlinepubs/nchrp/nchrp_rpt_641.pdf. 6 According to FHWA (https://www.fhwa.dot.gov/legsregs/directives/fapg/cfr0652.htm), a bicycle route is "a segment of a system of bikeways designated by the jurisdiction having authority with appropriate directional and informational markers, with or without a specific bicycle route number." 7 D. J. Torbic, J. M. Hutton, et al. NCHRP Report 641, Guidance for the Design and Application of Shoulder and Centerline Rumble Strips, Transportation Research Board, Washington D.C., 2009. Available at: http://onlinepubs.trb.org/onlinepubs/nchrp/nchrp_rpt_641.pdf. 8 Interview with John Miller, Joe Jones, Ashley Reinkemeyer, Michael Curtit, and John Donahue, Missouri DOT, conducted on June 5-6, 2013. 9 Interview with Mark Hunter, David Rogers, Andy Johnson, Brett Harrelson, Joey Riddle, Rob Bedenbavgh, and David Cook, South Carolina DOT, conducted on January 23, 2013. 10 Interview with Gary Modi, Chris Speese, Lydia Peddicord, Scott Nazar, Brian Sanders, and Josh Freeman of PennDOT, conducted on August 27, 2013. 11 Interview with Jill Morena, Tracie Leix, Deirdre Thompson, Curtis Bleech, Andy Bennett, Tim Croze, Marc Beyer, and Erin Chelotti of Michigan DOT and Tim Gates of Wayne State University, conducted on May 22-23, 2013. 12 Arizona DOT, "Cycle Arizona Bicycle User Map," (Phoenix, AZ: ADOT, 2009). Available at: http://www.azbikeped.org/images/Map2009_v12_0409_lowres_side1.pdf. 13 Savolainen, Peter T., et al., TRR No.2314 "Lateral Placement of Motor Vehicles When Passing Bicyclists," 2012. Available at: http://trrjournalonline.trb.org/doi/abs/10.3141/2314-03. 14 Finley, Melisa D., et al. "Studies to Determine the Operational Effects of Shoulder and Centerline Rumble Strips on Two-Lane Undivided Roadways," August 2009. Available at: http://d2dtl5nnlpfr0r.cloudfront.net/tti.tamu.edu/documents/0-5577-1.pdf. 15 Datta, Tapan K., et al. "Impact of Non-Freeway Rumble Strips Phase 1," June 2012. Available at: http://www.michigan.gov/documents/mdot/MDOT_Research_Report_RC1575_Report_394019_7.pdf. 16 Savolainen, Peter T., et al., TRR No.2314 "Lateral Placement of Motor Vehicles When Passing Bicyclists," 2012. Available at: http://trrjournalonline.trb.org/doi/abs/10.3141/2314-03. 17 Interview with Jill Morena, Tracie Leix, Deirdre Thompson, Curtis Bleech, Andy Bennett, Tim Croze, Marc Beyer, and Erin Chelotti of Michigan DOT and Tim Gates of Wayne State University, conducted on May 22-23, 2013; interview with Gary Modi, Chris Speese, Lydia Peddicord, Scott Nazar, Brian Sanders, and Josh Freeman of PennDOT, conducted on August 27, 2013; interview with Mark Hunter, David Rogers, Andy Johnson, Brett Harrelson, Joey Riddle, Rob Bedenbavgh, and David Cook, South Carolina DOT, conducted on January 23, 2013; and interview with Gary Modi, Chris Speese, Lydia Peddicord, Scott Nazar, Brian Sanders, and Josh Freeman of PennDOT, conducted on August 27, 2013. 18Interview with Gary Modi, Chris Speese, Lydia Peddicord, Scott Nazar, Brian Sanders, and Josh Freeman of PennDOT, conducted on August 27, 2013. 19 Interview with Dave Olsen, Matthew Enders, T.J. Nedrow, Ian Macek, Tim Sexton, Mark Russell, Jeff Uhlmeyer, and Steve Bennett of Washington State DOT, conducted on October 30, 2012. 20 T.K. Datta, T.J. Gates, and P.T. Savolainen, Impact of Non-Freeway Rumble Strips, Phase 1, 2012. Available at: http://www.michigan.gov/documents/mdot/MDOT_Research_Report_RC1575_Report_394019_7.pdf. 21 Michigan DOT, "Share the Road" Public Service Announcement, Published on May 9, 2012. Available at: http://www.youtube.com/watch?v=MUL8l9_65Ic. 22 Interview with Jill Morena, Tracie Leix, Deirdre Thompson, Curtis Bleech, Andy Bennett, Tim Croze, Marc Beyer, and Erin Chelotti of Michigan DOT and Tim Gates of Wayne State University, conducted on May 22-23, 2013. 23 Interview with Mark Hunter, David Rogers, Andy Johnson, Brett Harrelson, Joey Riddle, Rob Bedenbavgh, and David Cook, South Carolina DOT, conducted on January 23, 2013. 24 Interview with Gary Modi, Chris Speese, Lydia Peddicord, Scott Nazar, Brian Sanders, and Josh Freeman of PennDOT, conducted on August 27, 2013; and interview with Dave Olsen, Matthew Enders, T.J. Nedrow, Ian Macek, Tim Sexton, Mark Russell, Jeff Uhlmeyer, and Steve Bennett of Washington State DOT, conducted on October 30, 2012.